Looking for Water Well Pump Installation throughout New Mexico? Well water can be an ideal source of consistent irrigation and crucial supply for your family and livestock. At Williams Windmill, we provide professional AC/DC submersible and solar pump installation service and more to keep your property running efficiently. Our experienced technicians can work collaboratively with you to decide the best model of well pump for your property’s unique needs, and which parts and systems will work best with your existing windmills. We’ve worked with a huge variety of well pumps and windmills throughout all of New Mexico, so we’re always available to schedule an onsite visit to your location and provide the best solution possible for your system. 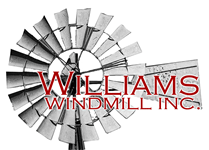 When you’re using your windmill to power your well pump, you’ll get the best service from a company with experience installing and repairing both – Williams Windmills Inc. We’re always available to perform a live inspection upon request. If you have any questions regarding our well pump services or if you would like to discuss your unique needs with an expert, contact us at 575-835-1630 today. Williams Windmill Inc. provides AC/DC submersible and solar pump installation services to communities throughout New Mexico.